Noriega served a 17-year drug sentence in the United States and was later sent to face charges in France. He spent all but the last few months of his final years in a Panamanian prison for murder of political opponents during his 1983-89 regime. Following Noriega’s ouster Panama underwent huge changes, taking over the Panama Canal from U.S. control in 1999, vastly expanding the waterway and enjoying a boom in tourism and real estate. 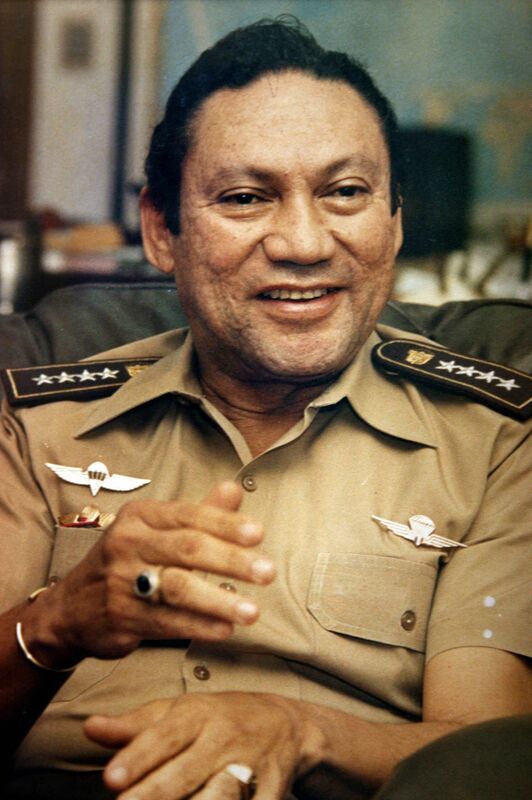 Known mockingly as “Pineapple Face” for his pockmarked complexion, Manuel Antonio Noriega was born poor in Panama City on Feb. 11, 1934, and was raised by foster parents. He joined Panama’s Defense Forces in 1962 and steadily rose through the ranks, mainly through loyalty to his mentor, Gen. Omar Torrijos, who became Panama’s de facto leader after a 1968 coup. As Torrijos’ intelligence chief, Noriega monitored political opponents and developed close ties with U.S. intelligence agencies guarding against possible threats to the canal. Two years after Torrijos died in a mysterious plane crash in 1981, Noriega became the head of the armed forces and Panama’s de facto ruler. Noriega also helped the U.S. seize drugs at sea and track money laundering in Panama’s banks, and reported on guerrilla and terrorist activities. Prosecutors accused Noriega of helping Colombia’s Medellin cocaine cartel ship “tons and tons of a deadly white powder” to the United States. Jurors convicted Noriega in April 1992 of eight of 10 charges. Under the judge’s instructions, they were told not to consider the political side of the case — including whether the U.S. had the right to invade Panama and bring Noriega to trial in the first place. “The humble, the poor, the blacks, they are the utmost authority,” Noriega said in one speech. Tags: Bush Administration, Noriega, Panama. Bookmark the permalink.